These outstanding filters offer revolutionary performance in light transmission and color balance. 12 layers of Super Multicoating are applied to the surfaces of the UV(0) models, which produces an average transmission of 99.7%! Coupled with maximum surface precision, this allows increased resistance to flare and stunning images can be recorded at wide apertures without compromising the performance of your lenses. Their slim profile of just 5mm avoids any vignetting problems and makes them ideal for use with wide angle lenses. HOYA Super HMC filters will appeal to the most demanding of photographers who require the ultimate in performance. Absorbs the ultraviolet rays which often makes outdoor photographs hazy and indistinct. A muliti-purpose fine-weather filter for color as well as black and white films. Also serves as a permanent lens protector. SUPER HMC These outstanding filters offer revolutionary performance in light transmission and color balance. 12 layers of Super Multicoating are applied to the surfaces of the UV(0) models, which produces an average transmission of 99.7%! Coupled with maximum surface precision, this allows increased resistance to flare and stunning images can be recorded at wide apertures without compromising the performance of your lenses. Their slim profile of just 5mm avoids any vignetting problems and makes them ideal for use with wide angle lenses. 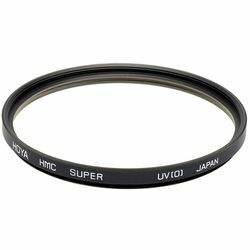 HOYA Super HMC filters will appeal to the most demanding of photographers who require the ultimate in performance.